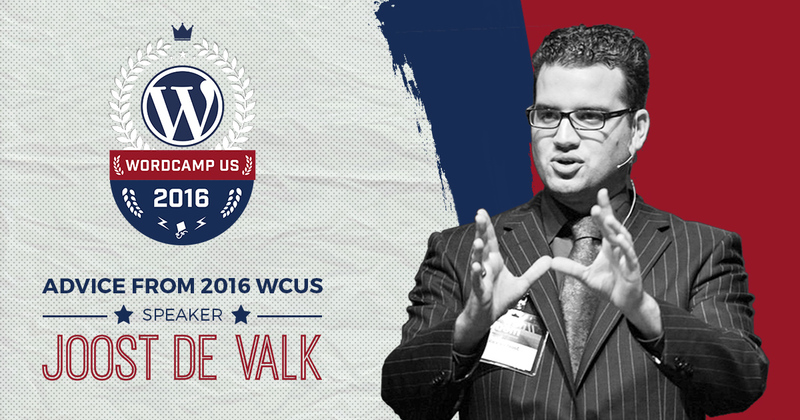 WordCamp US (aka WCUS) 2016 Speaker Joost de Valk recently spent some of his evening with us chatting about WordPress, the state of SEO, and, of course, advice about public speaking. Joost has been public speaking since 2009, primarily, worth noting, in English, which is not his native tongue. Joost de Valk is the CEO and Founder of Yoast, creators of the wildly popular SEO plugin Yoast SEO. Here are some of the gems from our interview. What drove you to apply for WCUS this year? How does WordPress relate to SEO? “There is a lot of movement. It’s up to the WordPress Development community to make it technically the best it can be and helping people writing good content. We need to democratize the findability of what they publish. We need to help everyone have the same tools to reach their intended audience. I love that Yoast SEO is used by large companies like StarWars.com and the bakery shop around the corner, too. They have the same tools to manage their site. That’s democratizing in a way that I think is empowering for everyone. Sharing the ideas whether it’s a business or a business blog or whatever. Is there anything specific that you’re doing to prepare for this presentation? “I’m working on my rough outline for now. After that I’ll talk to my wife and probably change all of it. And then I’ll talk to my design team and have them draw out illustrations for the slides. Then I’ll do the presentation for the Yoast team in the office so they can give me feedback and then I should be good. Our team is 35 people so they have an idea of what we do. They’ll have questions on terms, etc. It really helps in making it more accessible to more people. I find that more intimidating than speaking to a large crowd. They’re all Dutch so they give ‘Dutch feedback’ which is harsh. We’re very flat — there’s no one who is afraid to talk to me. Thank God. If you’re not flat like that, you’re probably not going to exist in WordPress. I still speak to customers every day in forums, in AWP — every day. Even though I’m very aware of what we do, we need to be open to the fact that another person may give you valid feedback. Is there anything you’re looking to discover at WCUS? “There are a lot of business goals for me in terms of meeting people and discussing things. [It’ll be good to] shake hands, have a beer, and just chat. Is your team participating in Contributor Day? Do you use WCUS as a source for new potential team members? “Not necessarily. We’re not a team of remote [workers]; our development team is all in one location. Our support is remote. We try to hire locally for development. There are some exceptions. What’s your advice for other WCUS Speakers? “First of all look up. You should really have a really good outline and be able to do it fluidly. You should not need your slides to read them out loud. If you’re going to read from your slides just get out of it. Who are you looking forward to hearing at WordCamp US this year? What are your speaking tips? Let us know in the comments below.